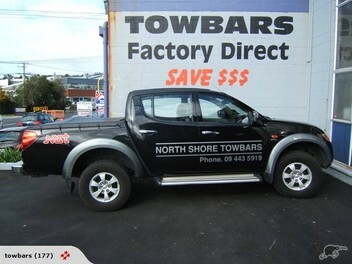 North Shore Towbars has been manufactur­ing towbars since 1976. We cater for all makes and models. Over 300 towbars in stock for prompt service. Towbars supplied and installed at ex factory prices. Please send make, model, year and registration number when making an enquiry. You will make significant savings compared to Dealer prices. Fully guaranteed for 5 years. Our towbars are made in our own factory by certified welders and fitted by qualified mechanics. We also fit the full range of Thule roof racks. What would the price be for a tow bar to be fitted to our 2011 Holden Commodore SV6. How much to fit a towbar on a Holden Barina please? Dont keep thinking about it and looking for towbar suppliers. Use these guys! Fitted my van up while i waited in good time, bar looks good ( added bullbar fitted as an option ) and stuck to the quote! I fitted many towbars as a mechanic over years and am pretty fussy and i cant fault this job. Thanks Team!! HI there! I have a tow bar fitted in my honda civic 2009. I want to remove it. I was wondering if you can do this job for me and how much? Phil: hi you have entered a review, please send question through our dealer listing. Just had NST supply and fit a new towbar on my estima - awesome job at a super price which could not be beaten by others in Auckland and a courtesy car supplied whilst the work was being done. Thanks NST - awesome! Phil: Thanks for your feedback much appreciated glad we could be of service. Phil: Hi , as you have posted your question on the view could you please post your question on the enquiry and we can then answer this for you. Great service , quality tow bar , free courtesy car too , highly recommend north shore tow bars , excellent communication . AAAA++++. Phil: Thanks for your feedback. Phil: Hi, sorry I cannot answer this as it has been asked through a review. Could you please send an enquiry?